Over the past two decades, dental implants have become the premier solution for missing teeth. Unlike other restorative options out there, dental implants actually replace the entire structure of a tooth, both above and below the gum line. This not only provides the most stable results possible, but the most natural-looking as well. Dental implants can be used to replace any number of teeth, and with the proper care, they can easily be expected to last for 30 years or more. A dental implant is actually a small titanium post that is placed into the jaw in order to mimic the root structure of a lost tooth, and this can be used to support a dental prosthetic to give a patient their teeth back. At Petty Dental, our office partners with only the best local oral surgeons to place our patients’ dental implants. Once this first phase of treatment is completed, they can return to our office to receive high-quality, custom-made restorations provided by Dr. Petty. To learn more about this treatment and what it could do for you, contact us today. Two of the most common restorations we use with dental implants are implant-retained crowns and bridges. A crown can be used to replace a single tooth, while a bridge can bring back multiple teeth in a row. An implant crown actually consists of three distinct elements: the implant itself, an all-porcelain crown, and an abutment. The abutment is a small metal connector that physically attaches the crown to the implant. After this is done, the crown will be virtually identical to the surrounding teeth because it will have the same root-crown structure, and we’ll make sure it is perfectly color-matched as well. You’ll be able to rely on it and even take care of it just like your other natural teeth. 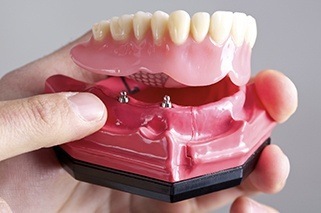 In the case of a bridge, two implant crowns will be placed on either side of the gap in the smile, and these will be bonded to prosthetic teeth to close it. Compared to traditional bridges, implant bridges are stronger, last longer, and look more natural as well. Are you sick and tired of your unreliable and uncomfortable denture? If so, dental implants can help you finally get a set of teeth you can trust. Stronger Hold: Because the denture is anchored directly to the jawbone, it is much less likely to slip, slide, pop, or click unexpectedly. More Consistent: The dental implants support the jawbone from the inside, which helps it maintain its natural shape over time. The result? A fuller, younger looking face, plus the denture will maintain its day one fit for much longer. 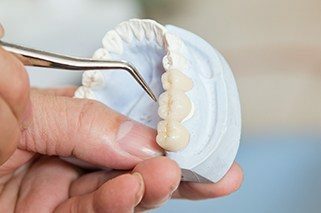 Better Bite: Patients with an implant-retained denture have a bite force much stronger compared to a regular denture, allowing them to enjoy a more varied and healthy diet with relative ease.